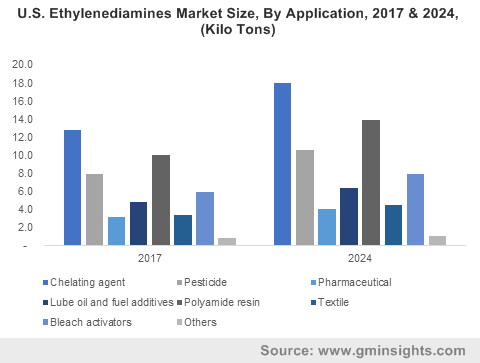 Ethyleneamines market size was over USD 2 billion in 2017 and industry expects consumption of above 700 kilo tons by 2024. Ethyleneamines are commonly used in surfactants for their good foaming characteristics which is likely to propel product demand by 2024. Growing consumer awareness regarding cleanliness and hygiene has led to high demand in laundry and detergent products, thus promoting ethylene amines market size in surfactant application. Growing investments in research to develop novel products with improved properties to make them more eco-friendly supported by technological advancements will propel product demand. Ethyleneamines market size is anticipated to grow significantly owing to its application in textiles industry. Aminoethyl ethanolamine has inimitable features and is used as an intermediate in fabric softeners, production of detergents and chelates which is likely to propel product demand by 2024. Global textile market size in projected to surpass USD 1 trillion by 2024 which is likely to propel product demand. Ethylenediamine is an organic complex which is used chemical synthesis. Growing product application as chelating agents, bleach activators and corrosion inhibitors may boost industry size in forecast timeframe. Global personal care products market size is anticipated to surpass USD 650 billion by 2024. Ethyleneamines finds usage in production of personal care and home products. Ethylenediamine is used for production of tetraacetyl­ethylene­diamine, which is used as a bleach activator in pulverised detergent structures. These amines are also used for producing amphoacetates, which are essential constituent in detergents including baby care products, shower gel and shampoo. 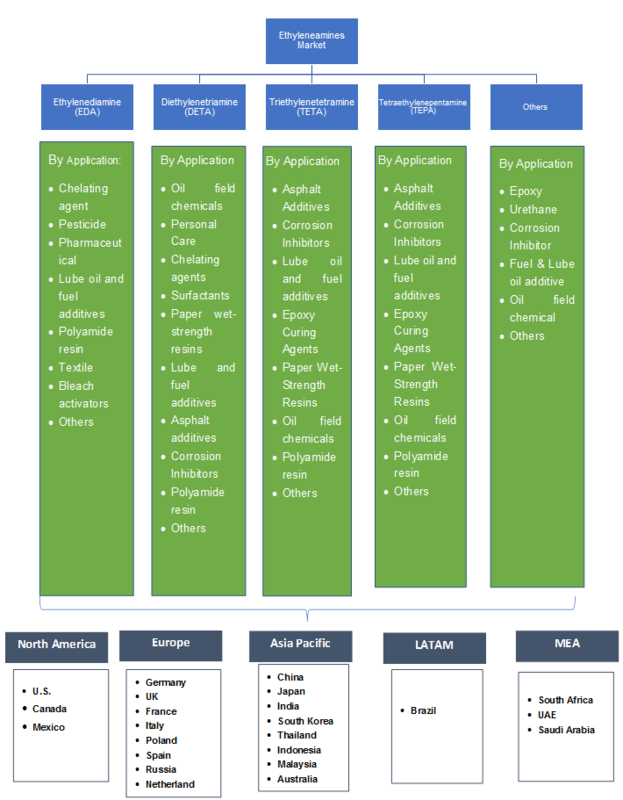 Factors including high viscosity & versatility along with extremely reactive properties are likely to drive Ethyleneamines market size in forecast timeline. These are volatile molecules that changes properties of chemical products like making them flexible, firm and soft along with adhering better and stopping products from coagulating. Ethyleneamines can be used in the manufacturing of adhesives, pharmaceuticals, cosmetics, paint and paper rolls which is likely to foster industry growth. Growing acceptance of Ethyleneamines in pharmaceutical industry for manufacturing antimalarials, local anesthetics, antidepressants, antibiotics, antihistamines and muscle relaxant may drive product demand. Ethyleneamines has extensive application space in coating industry as a wet-adhesion agent for latex paints. Its usage as a derivative for improving latex paint surface bond under clammy conditions may propel product demand by 2024. Instable raw material prices along with severe regulations by European commission pertaining to manufacturing and using safe chemicals may limit industry profitability thereby affecting Ethyleneamines market price trend. Diethylenetriamine market size may witness strong gains of up to 4% due to strong use in paper industry. It is broadly used to provide wet-strength properties to paper. Paper is treated with the product to be used in packaging for food, milk, towelling and tissue products. Strong application scope in photographic filter and numerous non-woven products is anticipated to fuel product demand. Triethylenetetramine market size is anticipated to surpass USD 800 million by 2024 owing to its application scope in fuel additives, fabric softeners, epoxy curing agents, paper wet-strength resins, lube oil, asphalt additives, and bitumen chemicals. These end-use applications are likely to promote product demand in the forecast timeframe. Ethylenediamines (EDA) market size from pesticide application is projected to surpass USD 290 million in the forecasted timeline. These products are used to make fungicide which are used as agro-chemical in agriculture sector. EDA is also used for prevention of blight, rust, mildew and scab which is likely to propel product demand in by 2024. Diethylenetriamine (DETA) market size from chelating agents’ application is poised to outdo 10 kilo tons in anticipated timeline. Diethylenetriamine (DETA) are appropriate to be used as chelating agents. These products function by establishing stoichiometric complexes known as chelates. DETA is used in applications where definite metal ions need to be buffered and interfere with processing, thus propelling product demand. Asia Pacific led by, Australia, Japan, South Korea, India and China market size is projected to surpass USD 1 billion by 2024 owing to strong application scope in automotive and agriculture industry. Rising disposable income has prolonged demand for passenger and commercial and vehicles in the region leading to growing prospect for these products to be used as additive. Upsurge in demand for chelating agents to be used in water treatment industry is anticipated to boost ethyleneamines market size in this region. Europe driven by Italy, France, UK, and Germany ethyleneamines market size may observe significant gains at 4% by 2024 owing to being production centers of automobile players including Volkswagen, Mercedes, BMW and Renault. Increasing application potential of the product in home and personal care products owing to usage as essential ingredient is likely to foster industry growth. Brazil ethyleneamines market size is anticipated to witness strong gains owing to flourishing agriculture industry in the region. These products are extensively used in pesticides, which is likely to drive product demand in projected timeframe. Global ethyleneamines market share is competitive and moderately consolidated with major industry players includes The Dow Chemical Company, BASF SE, Tosoh Corporation, Huntsman Corporation, Delamine B.V., Diamines & Chemicals Limited and Akzo Nobel N.V. Companies are concentrating on merger and acquisitions activities with regional & local companies to grab new market prospects which will supplement ethyleneamines industry growth. Ethyleneamines are organic compounds made of primary, secondary, tertiary amino groups associated with ethylene groups. These are viscous colourless liquids which are characterized by ammonia like odour. These products have strong bases which find application scope as chelating agents. Ethyleneamines has major application in automotive, resin, pharmaceutical, adhesive, paper, water treatment, agriculture, textile and personal care. Ethylenediamine and diethylenetriamine are key by-products and are used as reactive intermediates to produce useful chemicals. Historical data coverage: 2013 to 2017; Growth Projections: 2018 to 2024.